I stood on a small knoll, but high enough to overlook a large valley basin. Looking back toward the three horse trailers still hooked to the trucks, complete with three wild horses in each trailer, my heart beat fast; which, my gut told me everything was okay. The friendly sun, high in the blue sky complete with a few white clouds around, shined its light directly upon us. The slight breeze smelled of fresh rye in the vast basin fields to my front. Mother Nature has blessed us this day, as we return her children to their rightful home. We placed no chemical or other methods derived from human-perception, within their bodies – we will leave them with how we helped them, with pleasant memories, and know that a proper respect was taken and given, from living souls, one to another – human to horse, horse to human and each in our way. We setup block-transmitters, to block GPS, so our final unload-destination, or telemetry, was not recorded, anywhere. The wild horses finally safe from the mediocrity, from the lies, from the deceit they experienced from humans. Oh yes, they understood the abominations and the plight they faced. They understood all right, it was in their eyes, in their jerky and stressed reactions to every movement, when we first picked them up. Now surrounded by the smell of the rye grass, they stood motionless inside the trailers. Silent, unmoving, and their eyes – I could see their eyes while I walked toward the trailers. Love is the only term I could really think of at that moment, and the child-like anticipation they showed. They knew they were safe. I raised my hand in the air, gave the slide-out sign. The trailer doors opened simultaneously. The first horse, in the far trailer stepped out, the mare, the Queen. Her majestic manner expressed a Queen, for sure. Her stance as she watched her Stallion, James, step out from the trailer nearest me. I simply knelled and watched, along with the crew, at such amazing and majestic movements from these horses. They knew their homeland well. Each sniffed and snorted for a moment. Finally, they understood in total, the ground they stood, being safe for all of them. A yearling stepped out, then another from the middle trailer. Another yearling, a mare beside it we named Princess, then the other mares, stepped beside their yearlings, nudging, licking. Nine wild horses. Nine horses to start something we knew would become of a natural circumstance, within a natural environment. The need for our ego-blessed manipulations did not exist – we saved them from those who believe their manipulations correct, and Mother Nature wrong, for some odd reason. But one thing we all believed in doing this, was that we knew the twisting and reworking of the term Humane was worthless – their definition not of Humane Reasoning what so ever; because just like the wild horses, we knew those who benefited from birth controls and castration, were only mindful toward greed, toward wild horses no longer existing on this planet. 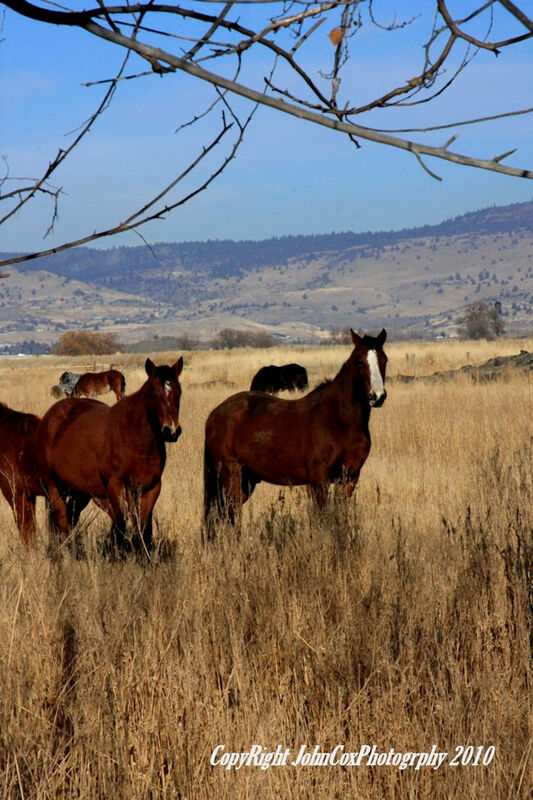 The small band of nine horses come together in the knee-high rye grass. James stopped, looking back at me, his eyes glowed, his stance majestic, his black coat swayed, his mane blew upward, in contrast with the green rye grass around his legs. The breeze swayed the grass very slight, as if bowing to that same majestic stand of James. His chest thrust out. He was telling me, Thank You. I know what you did, and for my family and I, Thank You. I am pretty sure a tear run-down my cheek, but I wiped it away. As the Queen nudged James, he snorted, turned toward her, then they, all together galloped off. A band together. A band free of intrusion, free from humans. I gave the signal to load-up. As the trucks started, and everyone on the crew in the trucks, I stopped at the door of the truck. I stood for a moment, then could not resist. I glanced around one last time. James’ band was running over the knoll a short distance away. He had stopped, turned, and was looking at me for the last time, as if a salute given, between both he and I. As he turned and galloped off, to catch up with his band. I turned and got into the truck, not looking back again. We done something good in life and saved some souls. How much better can life become? Well, to do it again, in another area, band by family band, another time, and save another soul.